Oujda (Arabic: وجدة‎) is a major ceety in eastren Morocco wi an estimatit population o hauf a million. The ceety is locatit aboot 15 kilometers wast o Algerie an aboot 60 kilometers sooth o the Mediterranean Sea. It is the caipital o the Oriental Region o Morocco an the birthplace o the current Algerian preses Abdelaziz Bouteflika. The urban aurie o Oujda haes got a beach cried Saidia. There is some evidence o a settlement durin the Roman occupation, which seems tae hae been unner the control o Berbers rather than Romans. The modren ceety wis foondit in 994 bi Ziri ibn Atiyya, keeng o the Zenata tribes. Further additions wur made in 1048. The ceety wis rebuilt in the 13t century bi sultan Abou Youssef. The French occupied it in 1844 an again in 1859. An aa tae the wast is the site o the 1844 major Franco-Moroccan Battle o Isly. Ance Morocco wis occupied bi the French, Oujda wis uised as a military base tae control eastren Morocco. The ceety grew up alang the roads that wur built an owes muckle o its present form tae the French. 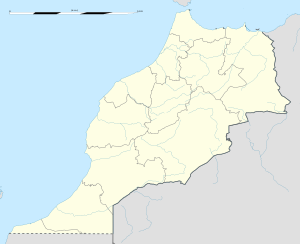 The Moroccan border wi Algerie is juist east o Oujda, on the ither side o the border is the Algerian toun o Maghnia. The state o the border crossin depends on relations atween the twa kintras which are aften strained. Uqba ibn Nafi began the Arab conquest o the region, durin the reign o the Umayyad Caliphate, a conquest which wis completit in 705 AD bi Musa bin Nusair. In the mid 11t century, Oujda acquired prominence through its strategic position on the road east frae Sijilmasa. Throughoot the history o the dynasties o the Muslim West, Oujda played an important strategic role amang the Merinids, settled in Fez, in this case as a rear base in their conflict wi the Abdalwadids o Tlemcen. This situation wis at the oreegin o several destructive invasions o Oujda. The ceety experienced great difficulty in makin peace wi its neighbours tae the east, an sometimes tae the wast, acause o its position in respect tae the clashes atween the Saadi dynasty an Turks. It wis torn atween the rulers o Fez an the disputit Tlemcen, an frae the 16t century, it wis contestit biy the Alaouite Dynasty o Morocco an the Turks in Algiers. In 1692, Sultan Ismail led in the Turks, who establisht their hegemony on Algerie. Oujda fell again unner Turkish rule in the follaein century. Gharnati refers tae a variety o Moroccan muisic oreeginatin in Andalusia. Its name is relatit, being derived frae the Arabic name o the Spainyie ceety o Granada. Gharnati constitutes the muisical mode maist uised in the Moroccan ceety o Oujda, whaur besides this muisical kynd is omnipresent an whaur ane organizes each year in Juin the Internaitional Festival o the Gharnati muisic. This muisical airt wis preserved mainly in Oujda an Rabat an near moroccan-algerian borders at Tlemcen in Algerie. Like Oran is Oujda the destination o raï. Oujda is hame tae the Mohammed I University, a French, Inglis an Arabic leid an technology university. The ceety is served bi Angads Airport, which haes connectin flichts tae Amsterdam, Brussels, Madrid, Marseille an Paris. Oujda has a cement works. The city is the endpoint of the mainline from Casablanca via Fez and Taourirt before the border with Algeria. There are several day and nighttrains to and from the city linking it to the Western part of the country. Apart from this raillink and many bus/coach services the city also has an airport offering both national as international destinations. Syne 2009, the ceety haes been twinned wi Trowbridge in Ingland due tae the huge number o diasporans maist o whom oreeginate frae villages close tae Oujda. Trowbridge haes the lairgest Moroccan community in the UK ootside London. Oujda group - an Algerian poleetical faction named efter the toun. Wikimedia Commons haes media relatit tae Oujda. ↑ "POPULATION LÉGALE DES RÉGIONS, PROVINCES, PRÉFECTURES, MUNICIPALITÉS, ARRONDISSEMENTS ET COMMUNES DU ROYAUME D'APRÈS LES RÉSULTATS DU RGPH 2014" (in Arabic and French). High Commission for Planning, Morocco. 8 April 2015. Retrieved 29 September 2017. ↑ See: Ahmed Siraj, L'Image de la Tingitane. L'historiographie arabe medievale et l'Antiquite nord-africaine. École Française de Rome, 1995 (ISBN 2-7283-0317-7), pp 589-595 discusses the archeological evidence. This page wis last eeditit on 16 Mairch 2019, at 17:38.